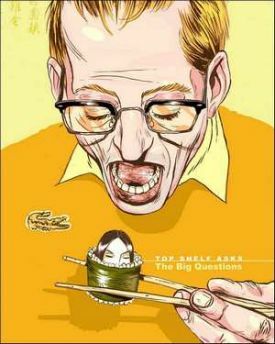 Top Shelf: Asks the Big Questions was a comix anthology that Top Shelf Productions published in 2003. Clocking in at a cool 335 pages, it begs the questions: what makes a great anthology? Does a great anthology need a unifying theme, or should it reflect what’s happening in the world of comics, particularly in terms of which cartoonists are doing the most interesting, experimental, or daring work? I lean towards the latter. Rather than worry about common themes, a quality comix anthology (let alone a great one) should showcase work by those cartoonists that are challenging the status quo and experimenting with the graphic narrative, whether they are doing it with short stories or graphic novels. There is certainly a lot of experimentation here. Top Shelf: Asks the Big Questions remains an exceptional work also because of the scope of the cartoonists included. Editors Brett Warnock and Robert Goodin reached across the Atlantic and also culled work from cartoonists Warnock publishes at Top Shelf and cartoonists who are part of Goodin’s Robot Publishing gang (a group of professional animators, led by Goodin, who make comics). Asks the Big Questions included what was at the time new work from James Kolchaka, James Sturm, Steve Weissman, and Mack White, among others. There is a section by the Swiss avant-garde cartoonist collective, Arta Bile. One of the best of that section is Frederik Peeters' “Le Petit du Bonheur,” an exceptionally engaging autobiographical read focusing on a dog watching his island home fall to yuppie invaders. Tom Tirabosco offers a short about a boy and his egg-laying father, a delightful tale drawn in charcoal and deftly portraying a playful father-son relationship. Robert Goodin and Robot Publishing cohort Cathy Malkasian offer two outstanding shorts. Malkasian (who co-directed The Wild Thornberrys Movie) opens Asks the Big Questions with a story that was and is still highly relevant, “Fluff N’ Fold,” about vanity, plastic surgery, body self-image, and recklessness. Goodin offers a fantastic animal fable with a bite that jumps off the page. Alan Moore and Melinda Gebbie found a home for “Brighter than You Think.” It was a story narrated by “Cobweb,” one of the four stars of Alan Moore’s Wildstorm/ABC anthology, Tomorrow Stories, but DC Comics, Wildstorm’s parent, refused to publish it. “Brighter than You Think is a quasi-biographical overview of real life personality John Whiteside Parsons, a rocket scientist and infamous occultist. It’s a weird read, and oddly troubling, but it’s Alan Moore, for sure. Besides all these wonderful comix, the best thing about Top Shelf: Ask the Big Questions is an eight-page section of tributes to Charles Schulz and the end of Peanuts from various alt-comix cartoonists. Some of these tributes previously appeared in the Austin American-Statesman. Tributes from Chris Ware (Acme Novelty Library) and Seth (Palookaville) reside at the back of the book. The main section of “Peanuts: A Cartoonists’ Tribute" includes cartoon and/or essay tributes from Ivan Brunetti, Warren Craghead (an inventive six-pager), Bill Griffith, David Lasky, Joe Matt, and Eric Reynolds, among others.